Vicks VapoRub might give you relief during a spell of common cold. But did you know that it could also help fight nail fungus that makes the nails to turn yellow? Y ou have to file the nail and rub in the balm. It gives a slight stinging feeling. Slowly the nail will turn from yellow to brown and begin to grow off. You have to do this twice a day. Always file the nail as far as you can each time before the application of this ointment. Someone I know had tried this and the results were pretty fast. ZetaClear Nail Fungus Relief, a natural product designed to treat nails disfigured by nail fungus might also help. Thanks for dropping by my blog. I've just begun using my salt lamps. I love the warm glow and am amazed at the difference they make in the air quality in my home! Vicks is surely one of the most economical remedies for nail fungus. By personal experience, I have found that very high quality (therapeutic grade) essential oil of Melaleuca Alternifolia (Tea Tree) is an excellent choice. You may find a source for this through my reflexology website: www.footstepsineden.com -- You will find an aromatherapy link there. 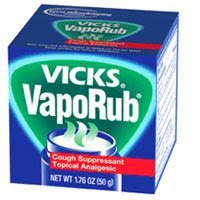 Vicks Vaporub is also known for its effectiveness to treat Nail Fungus The reported usage is to rub your nail or toenail with a generous dose of Vicks two times a day, and under a few days, you will find it improved. Vicks for Nail FungusThe treatment is rather long, and you will have to insist for about six months or more to be freed of the nail fungus. Preferably, you will have to continue the treatment until the new nail is completely grows, because if a parcel of the infected nail remain, the fungus will reappear. Vicks Vaporub has no reported side effect. An antiseptic mouth wash also prevents further growth of fungus within the nails. The tea tree oil is also very useful for this purpose. Other excellent combination are olive oil or lavender oil with the tea tree oil. Toenail fungus can be unsightly. Try soaking the infected nails for at least fifteen to thirty minutes daily. The recipe: one part vinegar to two parts warm water. Allow six weeks to see a cure. Dry feet very very thoroughly after bathing. Apply membedazol or imidazol based cream below nails every day during 4 weeks. According to severity the nail will grow out cured or fall out. The new nail will be fungus free. I have the same problem, my dr. told me the nail fungus was far less harmful than the pills and did not recomend them at all. I've tried vinegar to treat nail fungus, it made a little difference but never really got it to go away. Personally, I've tried a lot of different stuff over the years. I had dealt with the combo nail fungus and athletes foot for almost 20 years. One "free" thing that did help a lot was vinegar. It didn't help much with the nail fungus but it completely stopped the athlete's foot that I was also suffering from. For the fungus I tried a lot of different things, including over the counter treatments, vinegar, bleach, tea tree oil, vicks and lavender oil. Some of them did make a little difference but none of them completely killed the fungus. I also tried lamisil which worked for a while then after a couple of months I had a relapse of the nail fungus. The scary thing with the lamisil is the possible health issues you can face as a result of using it, the doctor had me take a test to make sure my liver wasn't prone to problems before he'd give me the lamisil... gulp! In the end what finally fixed my loong term problem with nail fungus was Zeta Clear. I think what also helped is that I made it a part of my daily ritual to use it. It is useful for softening calluses on their feet or scaly skin on elbows. Tea tree oil is a potent natural antiseptic and fungicide that will help fight your fungus. Apply undiluted tea tree oil with olive oil to the affected toe nail. Alternatively you can put few drops of tea tree oil on toenails and rub it thoroughly every day.